Indian Dance will be among your beginning students' favorite keyboard music sheets. With an easy repeating left hand, it has a big sound. 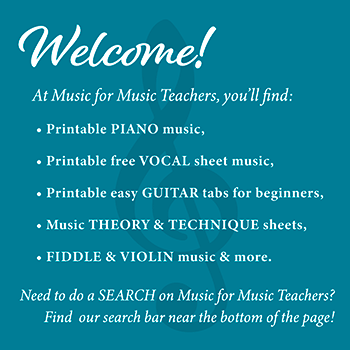 There are several versions here - scroll down the page for the links to the free downloadable PDFs! This is a very popular piece with new students. Indian Dance (composed by yours truly) is one of my beginning piano students' favorite songs to play. It satisfies the need for repetition, and for a loud LH (left hand) part they can really bang on the piano! JUST KIDDING. But once they have mastered the RH part (easy! 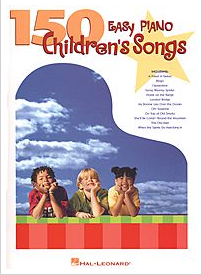 ), the LH chords come quickly, and it is great fun to play this free sheet music for kids over and over again. What? You call this a beginner's piece???!!! As with Mary Had a Little Lamb, I teach this piece with the help of a keyboard image in the music for hand placement. That's because "A," the first note, won't show up in their lesson books, usually, for a very long time. Expect them to forget your instructions! Of course, just because you carefully draw the finger numbers into the keyboard chart and have them locate the hand position on the keyboard doesn't mean they will remember to do this when they get home! Not just the musical knowledge, but looking at their lesson instructions, looking at the sheet music page for your scribbled hints... they are more likely, for a long time, to rely on their memory! So just learning how to work through their lesson sheets is a very important skill. I offer two versions here. The first page, above, is what I give my students; the second shows how the LH (left hand) chord should be played (for you teachers who want each note spelled out!). When is it appropriate to give this piece to beginners? Usually I introduce this piece to slightly older or extra capable children in the first five weeks of lessons. They learn it very quickly, and the left hand brings great excitement to the performance. What is really fun, once they have learned it well, is to then drop the left hand part down an octave, add the pedal(!) and play it twice through. Very occasionally, with an older or very precocious beginner, I will give this piece to a student on his or her second lesson.